Last year, I grew a beautiful bed of garlic! I mean is was gorgeous! I was so proud. 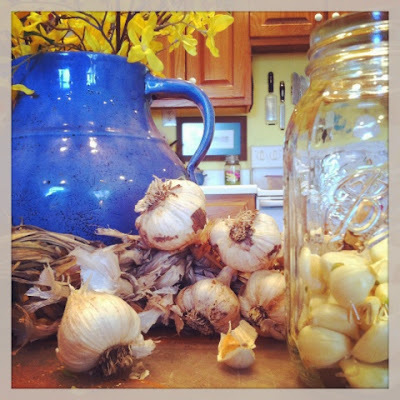 Around here, garlic does best planted in the fall and harvested around June or so. It was very satisfying to me to grow my own garlic. I had planted several times in the spring and did not have success... so for me, I will continue to plant in fall! Even if you don't get to plant your own, you can easily find organic garlic at farmers markets and in some grocery stores, or through bulk suppliers like Azure. Fermenting your garlic takes your already super healthy garlic and intensifies it's properties, but mellows the pungent boldness of the garlic flavor! All you have to do is pop the garlic out of the peeling. It takes a little time, but it's not hard at all. Let the kids help you. Sit around the table and talk while you do. Just enjoy the togetherness. Taking something you planted and harvested and are now preserving... well, that is a special thing. Doing it with your kids, that makes it even nicer. Anyhow, just take your garlic out of the skins and drop into a clean quart jar. Once your jar is full to the neck. Add a Tablespoon of good salt and if you like a Tablespoon or two of whey (optional), and spices (again optional). The only thing you have to have is salt, garlic and water.... You CAN add the whey and spices. I've made it both ways. They both work, so it is up to you!!! Fill your jar full of water. Put a lid on it and let it ferment for several days up to 3 weeks before you put it in cold storage. It's very easy, and it's very good! Once your garlic is ready, use it as you would fresh in any of your cooking or savory baking. We also use garlic for sickness. When a cold begins creeping in, we take a clove and mash it up and take a spoonful to ward off the problem before it escalates! If your kids are not fond of the garlic-iness ;) Add some to a little honey to make it easier to swallow. I've also heard eating a couple of raw almonds helps get it down without any harsh taste at all! One MAJOR reason to make your own, if you ever have purchased preserved garlic in your supermarket you are cheating yourself. Not only is it heated to highly, which kills off garlics wonderful properties, but it also is preserved with formaldehyde. Another one of the absurdities of big market companies who care NOTHING about the health of our people. Make your own! It's easy!